The Write Question is a weekly video podcast all about writing. Today’s question focuses on dealing with beta readers. Welcome to The Write Question, the video-podcast designed to answer your questions about writing. I’m Daphne Gray-Grant. 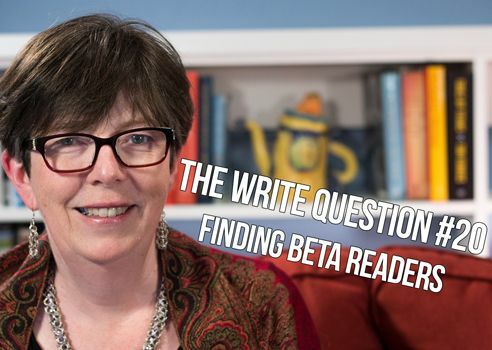 Today I’m answering a question about beta readers. Here’s the question. [recording] This is Anne Hungerford-Lowell from Noblesville, Indiana. I’m ready to have a beta reader look at my [book] manuscript and I don’t know who to choose or what their responsibilities are. Could you talk about that a little bit for me? Thank you very much! Thanks for asking such a great question, Anne. A beta reader — also known as an alpha reader — is a non-professional who reads a written work, and makes suggestions about how to improve it. This person can be a family member, a friend, a co-worker, really, anyone who is able to give you good feedback. Beta readers are not explicitly proofreaders or editors but they may be able to do SOME of that sort of work. This will allow you to take a cleaner manuscript to your ultimate editor. And that will not only save you money but it will also allow your editor to do a more sophisticated job. Sometimes you’ll look for a beta reader to focus on content. For example, let’s imagine you’ve written a book on great bridges in the world. You might want a civil engineer as a beta reader because they are familiar with the work required to build a bridge. Otherwise, beta readers can look at spelling and grammar and generally make suggestions about how to improve the readability of your work. When I finished my book, 8½ Steps to Writing Faster, Better, I had 16 beta readers and they did me an enormous service. In fact, let me confess that they made so many suggestions that I thought my professional editor would be left with nothing to do…. But I was wrong, when I sent the final manuscript to my paid copy editor, she returned it filled with red markings. But, I know the book is better for it. Thanks, Naomi! As for how to choose your beta readers, here are some questions I think you should consider. Do they have the time? Reading a 75,000 to 80,000-word book could take them a dozen hours or more, especially as they’re going to be stopping to take notes for you. This is a BIG commitment. Don’t ask it of anyone who clearly doesn’t have that sort of time. Are they prepared to be honest and specific? It might be self-affirming to hear, “Wow, that was a great book, I can’t imagine doing anything differently,” from one of your friends, but that’s not going to help you one iota. Make sure your beta readers have enough spine to be totally honest with you. And be sure to ask them to be specific. If they have a judgement, for example, they should be able to explain WHY they came to this conclusion. Do your readers represent the audience you hope will be interested in the finished book? Here’s where I suggest you look at your beta readers as a group. This could be based on profession, a common hobby, or cultural background. Whatever the topic, make sure your beta readers are interested in that area. Explain how you want them to work. These days, many writers find the “Track Changes” function in Microsoft Word to be most effective. But if you’re dealing with some non-tech savvy individuals, then you might want to ship them a paper version that you’ve printed out for them. Ultimately, however, you are the one who has to collect and respond to their suggestions, so make sure to pick a mode you are comfortable with. Also, be sure to give your beta readers a deadline. Just make sure that deadline is reasonable. Your beta readers are donating many hours of their time to you. Respect that gift. Also, don’t be surprised if at least a few of them fail to meet the deadline. We’re all busy people and you might need to remind them several times. Build time for that kind of delay into your schedule. Remember that they are doing you a huge favour. Be grateful, thank them profusely for their efforts and be sure to name them in either the preface or afterwords section of your book. Don’t argue and don’t take offense. Some comments from your beta readers may sting a little, particularly if they’ve been a bit harsh in delivery. Give yourself some time to think about their comments before you respond. That said don’t assume the beta reader is always right. Sometimes beta readers will make suggestions that seem, frankly, idiotic to you. You’re free to thank them for their advice and then to ignore it. Just be aware that if all six of you beta readers suggest the same thing, that’s a suggestion you should take seriously. When the book is finally published, be sure to thank them again and send them a free copy with a ribbon around it and a handwritten note. And be aware that if they’re authors too, you will need to return the favour one day. Good luck with your beta readers, Anne. Thanks so much for watching. If YOU have a question, you can email, tweet, or skype me. You can find the details in the description below along with any resources I’ve mentioned. And don’t forget to like and subscribe to the video.